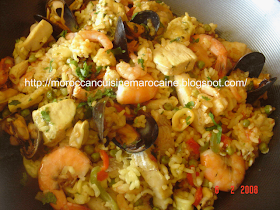 Moroccan Cuisine Marocaine: Seffa/teamed Rice! Comment cuire le riz à la vapeur! 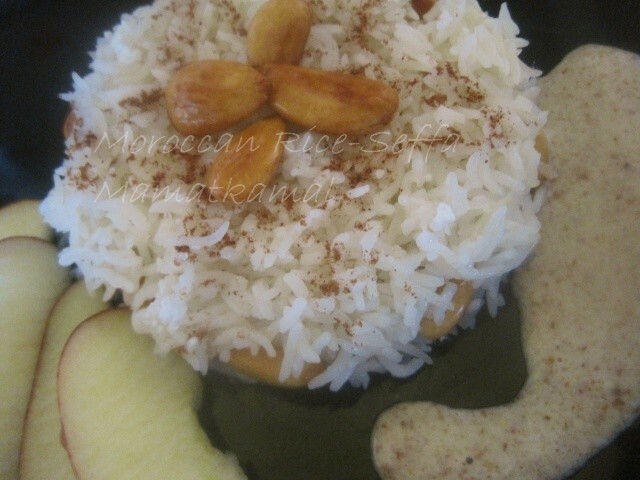 Both ways are so delicious, simple and tasty just like all her traditional moroccan recipes. For steaming the rice, you need a large Couscoussier (as we call it in French) and which is a Couscous-Pot called "Barma-Kasskass" in Moroccan language. The Cousscoussier is a traditional utensil, very popular in Africa, used in the steaming and cooking of Couscous. However, if you don't have Couscoussier, you may use simply any sort of pots with a strainer (just, make sure the holes in the strainer are small), then a cover. Traditionally in Morocco, to steam either Couscous, rice, vermicelle etc.... this usually take 3 times altogether, and this is what we call "Tafwira" = التّْفْوِرَة in Moroccan language. -500 gr rice of good quality (Abroad, I always use Basmati and in Morocco I use a type of rice called Rouz Glassé or Rouz dyal Seffa. I have no idea where the name "Glassé" comes from or what does it mean!) / 500 gr de riz (Là où je réside, j'utilise le riz Basmati, et si je suis au Maroc, j'utilise une sorte de riz qu'on appelle Rouz Glassé ou Rouz dyal Seffa. J'ignore ce que le mot Glassé veut dire ou son origine mais c'est un très bon riz qui convient parfaitement la méthode de cuisson à la vapeur! 1-Wash the rice: Pour it into a bowl full of cold water and rub it well with the hands, then wait a few minutes for the water to turn into a milky color, then pour out the water. Repeat this several times until the water in the rice remains clear./ Nettoyer le riz : remplir un bol d'eau froide et placer le riz dedans. Rincez longuement le riz sous l'eau froide en le frottant entre vos mains. Laisser reposer jusqu'à que l'eau change de couleur. Une fois que l'eau prenne une couleur blanche et crémeuse, jeter-le. Répéter cette opération jusqu'à que l'eau devient bien claire. 2-Soak the rice. Pour about 800 ml of cold water on rice and let sit until the rice puffs up. This usually takes about 1 hour. Drain the rice grains. Set aside / Faire tremper le riz dans l'eau froide, environ 800 ml, pendant envrion 1 heure. Egoutter le riz et réserver. 3-Fill Barma (the pot) with about 2 litres cold water, add some salt, lemon, orange, cinnamon stick and orange blossom water then place it on the stove over medium heat./ Remplir Barma (Marmite) avec environ 2 litres d'eau froide, ajouter un peu de sel, orange,citron, eau de fleur d'oranger et bâton de cannelle, puis placer sur un feu moyen. 4-Pour 1 tablespoon of oil on the rice, rub it well with the hands and mix well. Then once the water is coming to a boil, add the rice to the Kasskass (Strainer or Steamer), then place it into the top of Barma (the pot). The water should not actually be touching the strainer. / Verser 1 c à soupe d'huile sur le riz puis frotter-le avec les mains pour faire pénétrer l'huile dans le riz. Une fois que l'eau commence à bouillir, placer le riz dans Kasskass (Le récipient percé), et placer-le au dessus du Barma (Marmite). Ainsi, l'eau ne touchera pas le riz durant la cuisson. 5-Place the pot lid on top of Kasskass (Strainer or Steamer ) to keep as much of the steam and moisture inside as possible. Allow the rice to cook for about 20 minutes. / Mettre le couvercle sur Kasskass (Le récipient percé) pour que la cuisson soit homogène et que le riz ne colle pas. Laisser cuire environ 20 minutes. 6- If you notice that the steam starts to escape from the joint where Kasskass (Strainer or Steamer) and Barma (A large base or the bottom container) meet (See pictures below).... / Si vous remarquez que la vapeur s’échappe où les deux ustensiles se rencontrent et qui sont Barma (Marmite) et Kasskass (Le récipient percé) (Voir photos ci-dessous). 7-Pour the rice on a big bowl and pour about 50 ml of warm salted water and mix the rice with your hand or a fork. Set aside for about 10 minutes, this will allow the rice to absorb any last traces of water. Then add 1 tablespoon of oil and mix again. / Placer le riz dans un grand bol et verser dessus environ 50 ml d'eau tiède légèrement salée et bien mélanger le tout soit avec les mains ou une fourchette. Laisser absorber l'eau pendant environn 10 minutes puis ajouter 1 c à soupe d'huile. Bien mélanger de nouveau. 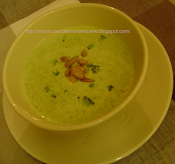 8-Add the rice to Kasskass (Strainer or Steamer), again allow to steam for another 20 minutes (No need to repeat, the rice should be well covered during the steaming procedure) / Placer le riz dans kasskass (Le récipient percé), et laisser cuire environ 20 minutes. Pas besoin de vous rappeler de bien couvrir le riz durant sa cuisson à la vapeur. 9-Pour the rice on big bowl and check for tenderness, if the rice is not too hard or too dry, add only about 20 to 30 ml of warm water, if it is too dry, add about 50 to 60 ml of warm water and mix well. No need to add more oil or salt. Allow the rice to absorb all the liquid and this may take about 10 minutes. / Placer le riz dans un grand bol et vérifier si les graines de riz sont plus ou moins tendres, si elles sont moyennement tendres, ajouter seulement environ 20 à 30 ml d'eau tiède, mais si les graines sont encore dures et sèches, il faut prévoir d'ajouter entre 50 ml à 60 ml d'eau tiède. N'ajouter ni sel ni l'huile à ce stade de cuisson. Mélanger le tout soit avec les mains ou une fourchette. Laisser absorber l'eau pendant environ 10 minutes. 10-Cover and allow to cook for another 20 minutes. / Couvrir et laisser cuire pour environ 20 minutes. 11-Pour in a big bowl, add butter and mix well. Normally the sauce should be ready now to serve with the rice if it is cooked separately. Check for tenderness and your rice should be ready now to go with the sauce. When the rice is tender and if your sauce is not yet ready, put it back on the steamer, cover it and remove the pot from the heat but keep it covered until you are ready to serve the rice. This keeps the rice from drying out. / Verser le riz dans un grand bol, ajouter le beurre et bien mélanger. Le riz est prêt à servir maintenant avec la sauce, si elle est cuite séparément en même temps que le riz. Une fois que le riz est bien cuit, mais si votre sauce n'est pas encore prête, retirer le Couscoussier du feu, et bien couvrir le riz pour qu'il ne se déssèche pas. Un manière d'obtenir un riz léger. Parfait!